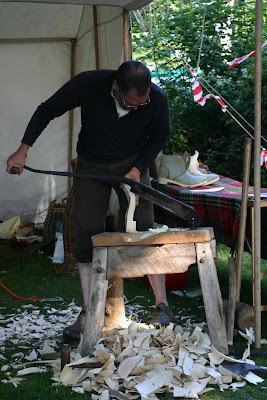 Until a couple of years ago Jeremy was the only clogmaker in the country still using the traditional knives to hand cut clog soles and make traditional British clogs. As was traditional in the mill towns of Lancashire and Rural Wales I have a pair of working clogs and a pair of posh clogs, I also have a pair of his shoes and sandles so I am a bit of a fan. The knives are not easy to use but once mastered give tremendous controled power and leverage. 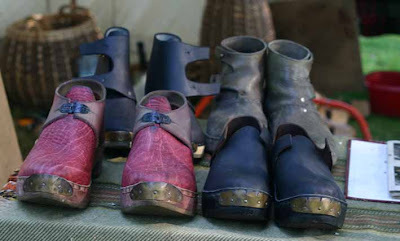 British clogs always had a wooden sole (alder, birch or sycamore) and leather uper unlike the Dutch and French sabot. 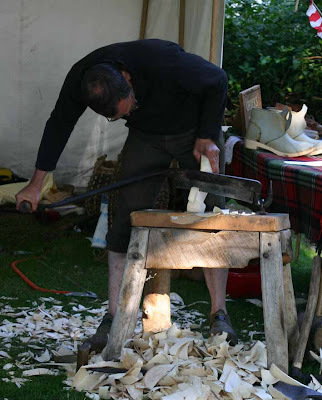 There is a lot of understanding that goes into making a clog that is comfortable to walk in rather than just stand still in and Jeremy's just work. That film was taken at St Fagan's museum in Cardiff whilst Jeremy was teaching Geraint who now makes clogs there. So now we have at least two makers hand cutting soles, the craft is still endangered but perhaops not quite so critically so. 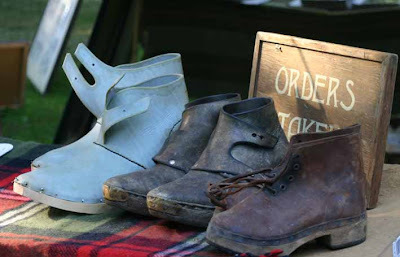 This is Jeremy's website though I must say he is notoriously difficult to buy a pair of clogs from, you have to nag for a while.